In a similar vein to my MACD and CCI Divergence indicators, here’s an indicator that checks for divergences between RSI and price. 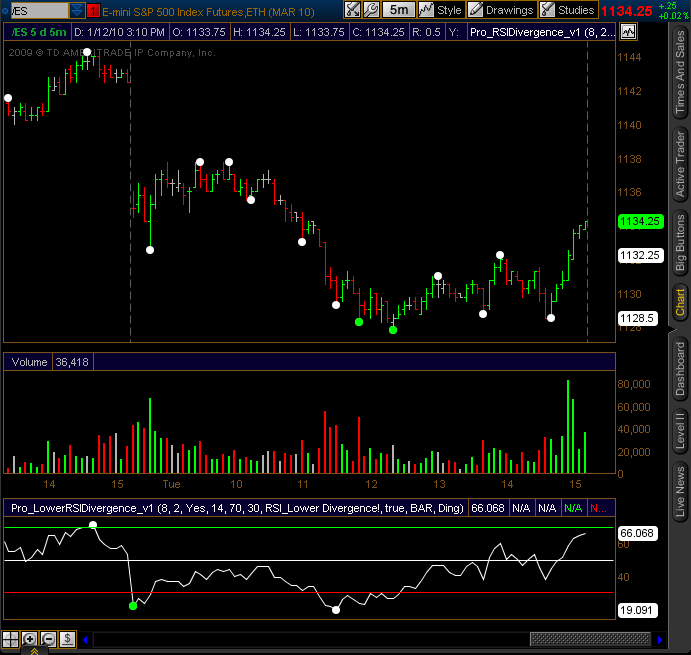 It’s basically just a modified version of the CCI divergence indicator I did, but using RSI instead. Also added is a filter that only plots signals if a bearish divergence is in overbought territory, and if a bullish divergence is in the oversold area. There are two indicators. The first, “Pro_RSIDivergence_v1STUDY.ts” looks for when the RSI values diverge from price making new swing highs or lows. The second, “Pro_LowerRSIDivergence_v1STUDY.ts” reverses the process, looking for price to diverge from new swing highs or lows on the RSI indicator itself, and is plotted in the lower panel. I would tend to use the upper one only, but you may want the other one, so I did it. I also added the alert code block that I highlighted earlier, so you can let it run on a chart and get alerted if a divergence shows up. The two studies are found in “Pro_RSIDivergence_v1.zip” and can be downloaded in the “Donors Only” section of “Released Thinkscript Studies” on my Google site. As always, home-gamers can ask me any questions if they want to make one for free by themselves. The CCI tutorial covers all the same coding I used for this one. This entry was posted on January 12, 2010 at 9:15 pm and is filed under Thinkscript. You can follow any responses to this entry through the RSS 2.0 feed. You can leave a response, or trackback from your own site. how about a divergence indicator for slow stochastics! Which line? %k or %d? Would it be possible to make a lower-case indicator that calculates and displays divergence (positive and negative) between RSI bottoms and tops, calculating price targets for positive and negative reversals? There is negative divergence in the RSI between 19.00 hrs (3/22/12), when RSI bottom = 34.8992, and 17.00 hrs (3/28/12), when RSI bottom = 27.5568. Corresponding prices at close in the index are 1387.5 and 1395.5, resulting in a difference of 8 points. The RSI top in between lies at 81.0982, when the index reached 1415.75. So, I add 8 points to the top in the index to arrive at a positive reversal of 1423.75. There is a strong probability that the target will be reached by Friday this week. What’s the password for the zip folder ? Just make any donation to the blog through the PayPal and it will be sent out to you. If you already donated in the past and need a reminder, email me directly at readtheprospectus @ gmail.